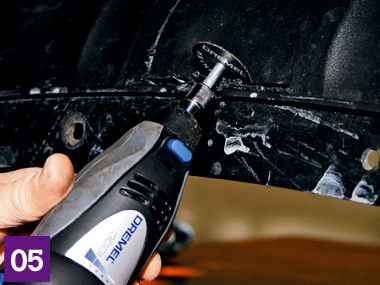 INSTALLING A TOWBAR and related items should be left to an expert if you don’t know what you’re doing. If you’re handy, however, a ready-made towbar kit isn’t hard to fit and will save you at least a few hundred dollars, if not more. It just takes patience, a clear, dry workspace with plenty of light, and the right tools. 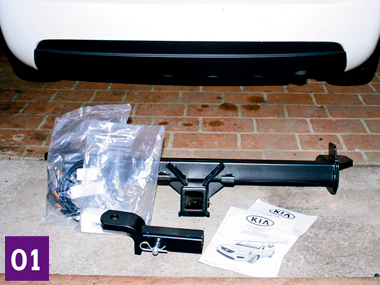 We fitted a Kia accessory towbar to the Kia Rondo 7. This application doesn’t have a great towing capacity (1400kg on the manual Kia, 1100kg on the auto), but it uses a box hitch design that is common with the more heavy-duty applications usually seen on tow vehicles. 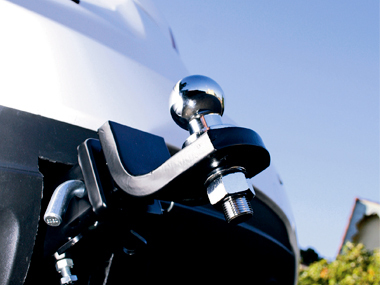 It is also one of the simplest examples of towbar fitment for a modern vehicle – with a towbar kit that has all mounting fittings and instructions and a vehicle that already has towbar mounting points ready to go. 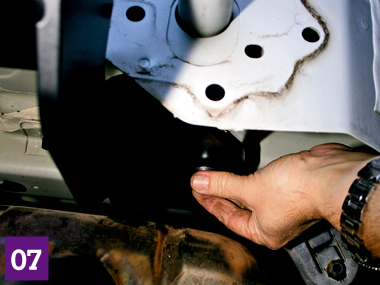 If you are fitting a used towbar, with no mounting hardware and an unknown mounting setup on the vehicle, you’ll be heading for trouble. Best to consult a caravan accessory shop to get the right parts for the job – or better still, leave everything to an expert. Often you’ll need more than a towbar, electrics and brake controller before christening a vehicle with its first van tour. A stand-alone transmission cooler is often an additional manufacturer’s recommendation or even a requirement, as some tow vehicles may not be up to the job without it. Standard radiator cooling capacity may also be insufficient and may require an upgrade. Rear shocks may need to be replaced with heavy-duty items. Some current vehicles also require software changes to suit towing applications. You can find all this information by calling the vehicle manufacturer or checking with a dealer. There are always exceptions to the rule. This towbar fitment was relatively simple with towbar bolt-up points already fitted at the factory, but some applications require you to drill holes through the rear box sections so that you can bolt up the towbar. Others again need reinforcement collars or shanks to ensure that the towbar bolts spread the load better and don’t begin to crush the box section if over-tightened. While many modern bumper designs don’t allow for a hitch and have to be cut to fit the bar, others are already equipped with a towbar cutout. Older models such as our Holden WB Statesman have a simpler towbar installation procedure but can be a bit fiddly when mounting items such as the trailer connector. Not all towbars are suited to heavy-duty towing applications and the addition of load-levellers. Sometimes an aftermarket heavy-duty towbar is the solution; in other cases you may have to live with either not towing with heavy ball loads, or – if you can use load-levellers – rigidly following the load-leveller manufacturer’s instructions to the letter (such as disconnecting the levellers when the vehicle and van pivot vertically, for instance when entering a driveway or spoon drain). So, do your homework and consult the experts if you’re not sure. 01 Assemble the towbar kit and tools required. If you don’t have a set tool list supplied with your towbar, you will at least need a socket set, screwdrivers (Phillips head and flat) of various sizes and shank length, a torque wrench and a tape measure. Additional cable ties to tidy up wiring and a length of pinchweld to neaten up the bumper aperture may also be required. 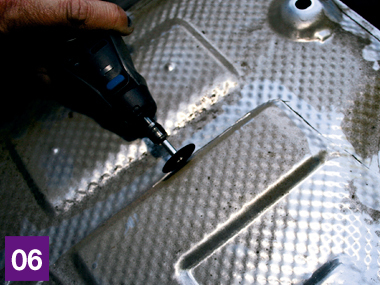 02 Disconnect the vehicle battery and remove any components at the rear of the vehicle required for access while fitting the towbar. In this case we had to remove the Rondo’s taillights and rear bumper bar and bumper supports. Some other vehicles are far simpler: we fitted a towbar to a WB Statesman that only required the removal of boot carpet trim and underlay. 03 Remove the bumper supports if necessary. 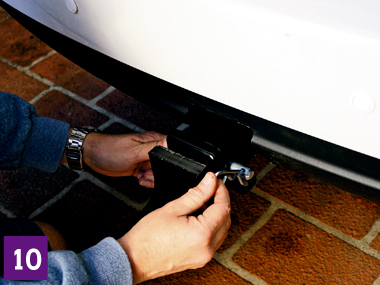 This is a common step for later cars with plastic bumpers, as the towbar in effect becomes a structural support itself. 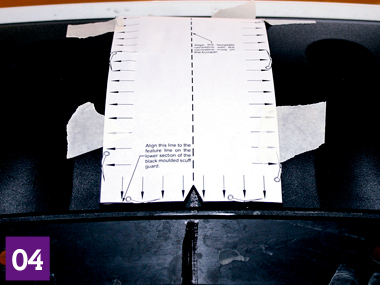 04 Prepare the bumper for cutting, using the materials supplied (as Kia has done here, with a cut-out template) or by measuring the centre line yourself. 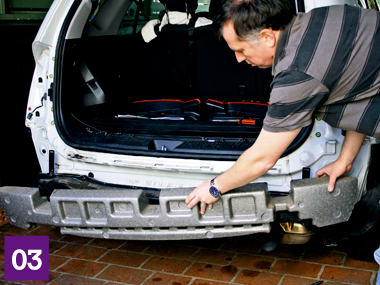 If you are unsure, mark your measurements on the bumper and take it to the vehicle to see if it matches up. 05 Cut the plastic bumper with either a small cutting tool as we use here or hand cut with a fine-blade hacksaw (which is time-consuming, but you’re less likely to make a mistake). If you’re not happy with the result, buy some automotive pinchweld and fit it to the bumper cut-out – it’ll look a lot neater. 06 Modify any vehicle components as required and refit – here the Kia’s exhaust shield had to be removed and a section cut out to allow room for the towbar. 07 Fit the towbar up to the vehicle, insert the mounting bolts and torque to specifications. This can be done solo but it is a lot easier with a helper, as towbars are typically 20kg-plus. 08 Wire up the trailer connection, in this case with the supplied loom. If no loom is supplied, then you’ll need 4mm-gauge insulated copper wire and clip connectors. Some modern vehicles require a dedicated loom, though, because if you tap into the taillight connections – as is possible with older vehicles – the newer vehicles will sense the current drain and declare it as a fault. 09 Refit the bumper and other components removed prior to bar fitment and re-torque to the manufacturer’s specifications.